Top organizations use simple, powerful tools to ensure clear, consistent assessments of skills and proficiency. eLeaP now incorporates Observation Checklists. LOUISVILLE, KY, UNITED STATES, July 5, 2017 /EINPresswire.com/ -- An observation checklist is a productivity tool that allows organizations to observe and document the progress of learners and team members. If you want a consistent, organized and easy way to improve skills and proficiency documentation, the eLeaP Observation Checklist tool is what you need. If you are in Health Care, Pharmaceuticals, Retail, Manufacturing, Automotive or even Trades industries, Observation Checklists are probably familiar to you. An Observation Checklist serves as a solid tool which enables organizations to more easily document standards and well as metrics. With some organizations as new hires come on, it will be important to also perform on-the-spot evaluations of their proficiency. Additional uses of Observation Checklists include on-the-job assessments using lean training methodologies for example, in manufacturing. Safety rules are important. Use Observation Checklist to ensure that you have proper records for comprehension and compliance. Documenting adherence to Standard Operating Procedures (SOPs) can be painful and expensive. Use the Observation Checklist tool to easily and quickly overcome this challenge. We know that depending on your industry, compliance training and documentation can be a challenge. With the eLeaP Total Training System including Observation Checklists, you are able to conduct assessments and document metrics and results. After all, you want to maintain the highest levels of workplace safety and wellbeing. For many organizations being able to quickly identify where red flags and hazards exists, can make the difference between a multi-million dollar OSHA fine or a clean record. 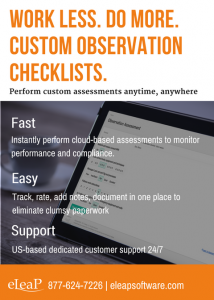 With the built-in mobile web Observation checklist feature, supervisors and other managers are able to instantly, and painlessly conduct assessments on the fly ensuring compliance and documentation. What do you get with the eLeaP Observation Checklist Tool? With a productivity tool like the Observation Checklist tool, Admins are able to quickly create and add assessment checklist statements into the system. With four different criteria to evaluate your checklist statements, every assessment scenario is covered. You can use the simple binary or Yes or No format or you can opt for rating scale based on a five-star rating system. For some customers using the verbal scale option provides more specificity for their assessments. Lastly, the eLeaP LMS Observation Checklist also deploys a custom rating system based on a range of points from ‘0’ to ‘10’ points. Customers who have looked at the Observation Checklist tool strongly agree that this learning management system will help them easily perform and document assessments. The best part is the strong push for mobile capability with this tool. The design deliberately enhances mobile access and use. With an intuitive tab and click simplicity, anyone can use this tool to perform assessment anywhere anytime. The Observation Checklist provides organizations a powerful insight into the level of skills and proficiency their team members possess. Using the Observation Checklist to uncover gaps and areas of risks can spur organizations to make prudent steps to ensure that the appropriate training and remediation is taking place. When using a tool as powerful and easy as the eLeaP LMS platform, you can easily add next steps to the training continuum. With Smart Assigning, for example, organizations can program the right next steps to automatically deploy additional learning and training.